During University (at the University of Sydney, and the University of California, San Diego) , I discovered there were many hidden paths through the University system; core subjects can be taken out of turn, and they can even be substituted for other similar-enough subjects, within or outside of the University. The default path outlined by the University is largely that, you really are free to craft your own education. The need to craft one’s own course was especially important in my degree; Design Computing, where 50% of the subjects were electives - and where courses and their associated teachers could change each semester. Over the years, I’ve realised a good teacher is everything; the course content doesn’t matter nearly as much as who’s teaching it. My University plan covered the extent of my tertiary education - but changed every semester; there would be vague sets of subjects I knew I would be interested in later on - which would require more distinctive pre-requisites early on. At the start of each semester (or prior) I would note down every possible subject I may want to attend (either officially or unofficially), prioritising pre-requisites that opened the door to more interesting categories of courses down the road. I then tried to attend parts of each course during the first week (or the previous semester to suss out the teacher and content) - as to get a better feeling of which courses should be taken officially, and which would simply be sit-ins. 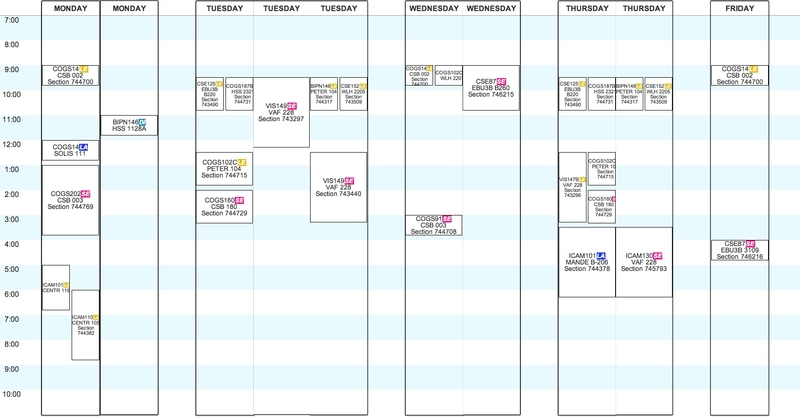 The photo below is an example of one of these pre-semester plan (UCSD Spring Quarter). An important realisation was that many core courses can often be substituted with another course of similar material - and such courses can sometimes be found in completely different departments (e.g. one core ‘Information Visualisation’ was taught, and could be substituted, across: Archaeology, Computer Science, Design, and Architecture). In undergrad - you can even sometimes elect to substitute in a post-graduate course! So you are not restricted to your faculty, nor your graduate-status, nor even your University (e.g. Exchange Universities and Colleges can sometimes offer better teachings on a subject - and more fun). P.S. If you’re in a degree where your marks don’t matter (mine was Computer Science & Design) - I’ve observed it’s always best to take the advanced class - even if you’re the bottom of the class; you’re surrounded by people much smarter than you whom are often more than willing to help (perhaps because they’re not spending time struggling as much with the content themselves). Overall; University is a great chance to learn and make new social groups - a little foresight and sit-ins are great for this. Many of the perceived structures and ‘rules’ in University Systems are more like guidelines and can certainly be challenged. Most of all - have fun!